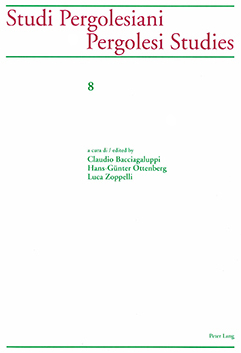 Claudio Bacciagaluppi, Hans-Günter Ottenberg, Luca Zoppelli , Prefazione, pp. 7-10. Vincenzo De Vivo, Die Pergolesi-Stiftung und -Forschung im Jubiläumsjahr 2010, pp. 11-14. Claudio Toscani, Schritte auf dem Weg zu einer neuen textkritischen Ausgabe der Werke Pergolesis, pp. 15-34. Kai Köpp, Giovanni Battista Pergolesi and the concept of musical ‘ortography’ – Understanding written and unwritten articulation in eighteenth-century music, pp. 35-52. Jóhannes Ágústsson, Giovanni Alberto Ristori at the court of Naples 1738-1740, pp. 53-100. Paologiovanni Maione, La musica ‘viaggiante’ nelle carte dei ministri napoletani a Dresda nel Settecento, pp. 101-170. Janice B. Stockigt, Italian composers listed in the «Catalogo 1765» («Schürer-Katalog») of the Dresden «Hofkirche», pp. 171-199. Ortrun Landmann, Porpora in Dresden, pp. 201-228. Stefano Aresi, Porpora tra Dresda e Vienna: i «Sei duetti sulla Passione di Cristo», pp. 229-257. Claudio Bacciagaluppi, Parodies in Pergolesi’s sacred music: some reflections on Central European sources, pp. 259-286. Marc Niubo, Giovanni Battista Pergolesi in eighteenth-century Bohemia, pp. 287-311. Václav Kapsa, Jana Perutková, Jana Spácilová, Some remarks on the relationship of Bohemian aristocracy to Italian music at the time of Pergolesi, pp. 313-341. Tomasz Jez, The reception of Neapolitan music in the monastic centres of baroque Silesia, pp. 343-369. Roberto Scoccimarro, The question of ‘mixed’ form in mass settings by Jan Dismas Zelenka and ‘Neapolitan’ composers of the early eighteenth century, pp. 371-405. Paolo Sullo, La fortuna europea delle raccolte di solfeggi di Leonardo Leo, pp. 407-433. Alessandro Lattanzi, The instrumental music of Domenico de Micco and its attribution to Hasse in German sources, pp. 435-451. Hans-Günter Ottenberg, Giovanni Battista Pergolesis «La serva padrona» und «Stabat mater» im Spiegel des deutschsprachigen Musikschrifttums des 18. und frühen 19. Jahrhunderts, pp. 453-497.